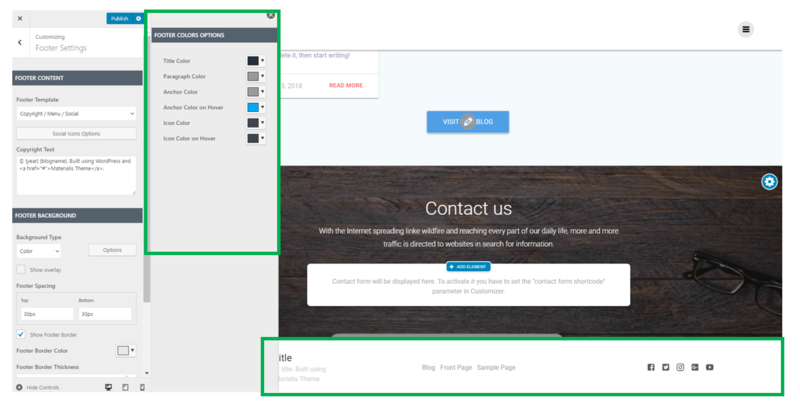 Go to the Customizer -> Footer Settings -> Footer Colors. Choose the footer type you want to apply to the website and start customizing its colors. This is the color that will make the title stand out. It will be visible for footer types that include a title. This is the color for the text in the paragraph included in the footer. This is the color of the anchor text (text on which links are placed). Choose the color the anchor text will have, when users hover over it with the mouse. This is the color for the social icons that will be placed in the footer. Select the color for the social icons that will be placed in the footer, visible when users hover over them with the mouse. This is the color of the last content box. Select the color you want and use it to make this content box more prominent in the footer.